Naturescapes aim is to create a bespoke design for your garden and we look to work with our clients to discuss their needs and aspirations. Following your initial contact we carry out a one to one meeting where ideas can be discussed along with budgets and timescales. A site survey follows where further options can be realised and from there a set of designs can be created and presented. We are delighted to be able to offer our clients a wide range of installation options. These include patios, paving, walling, decking, gravelling, driveways, fencing, gates, turfing, grass seed, soil treatments, external lighting and planting, to name a few! There are many variations to the above. Whether your aspirations are for a traditional or contemporary theme, we have it covered. In this busy world we all dream of having somewhere to escape to. Imagine a tranquil space to unwind with your favourite book or while away the hours indulging in your favourite hobby. 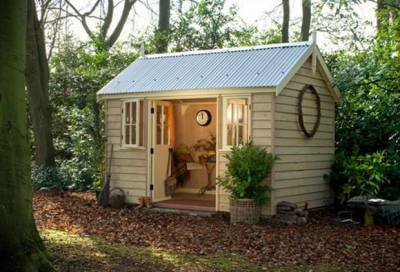 We have all heard of the 'man cave' but the rise of the 'she shed' is the new wave of exterior design. We offer a full design and installation service for Man Caves, She Sheds, Garden Offices or simply outside storage. Naturescapes Landscaping and Garden Services are a family run business based in the beautiful county of Perthshire. Although we are based in Perthshire we are located just 1 mile from the A9 which means we can cover Dundee, St Andrews, Fife and Perth City. Founded in 2006, Mark O'Shea teamed his passion of the outdoors, technical ability, perfectionism and talent for good design to create Naturescapes. It must be in the blood as Mark’s Father was a gifted Landscape Architect who trained at the National Botanic Gardens in Dublin and went on to found a very successful landscaping business in Dublin. Mark is especially skilled at listening to his client’s requirements and really making the most of the outdoor space they wish to transform. At Naturescapes we provide you with a bespoke design and help you visualise the potential in your garden to create your dream outdoor space. Even if your project is small or simple and you already know what you want, Naturescapes would be delighted to discuss your vision and provide you with a schedule for straight forward installation. Anything from simple fence installation to large turnkey projects we would love to hear from you.